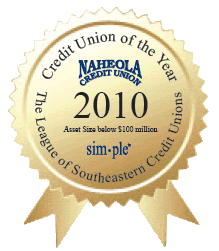 Naheola Credit Union is a community chartered credit union serving members in Choctaw, Marengo, Sumter, Hale, Greene, Perry, Clarke, Baldwin, Mobile, Escambia, and Washington counties. If you live, work, or worship in one of these 11 counties you can become a member too. Please be aware of attempts to gain account information (account number, PIN, etc.) through phone/text/email message scams. If you have doubts regarding a fraud alert, please feel free to call us at any of our branches or visit a local branch if you feel you have been a victim of a scam. Thank you! Mobile App Promotion Starting in January! Sign up for our Mobile APP today and be automatically entered for a chance to win a $200 Gift Card from NCU! You must already have online banking credentials to access the Mobile APP. Contact us if you need to set up online banking. You may also enter for a chance to win the gift card, by filling out an entry form at any of our branches. See below for contest rules and regulations. No purchase necessary to enter or to win. Signing up for our mobile app will not increase your odds of winning. All federal, state, local and municipal laws and regulations apply. Void where prohibited. Member must be in good standing starting January 2, 2019. Alternatively, enter this contest by visiting any one of the Naheola Credit Union branches and submit a completed entry form. Must be 19 years or older to submit an entry form. All entries must be submitted to the branch manager for consideration. Naheola Credit Union will not be responsible for incomplete, lost, late, misdirected, or illegal entries or for failure to receive entries. All entries become property of Naheola Credit Union and none will be returned. The giveaway takes place after 250 members have enrolled in our mobile app. Naheola Credit Union reserves the right to cancel this promotion at any time. The Sweepstakes winners will be notified by an employee who will call the winners up to five times during regular business hours at number provided on entry form or account agreement and will leave no messages. Failure to reach winner during these calls may result in disqualification of winner, forfeiture of his or her interest in all prizes, and selection of a substitute winner drawn at random. Prizes are non-assignable and nontransferable. No substitutions allowed by winner. Winners are solely responsible for reporting and payment of any taxes on prizes. Except where prohibited, acceptance of any prize constitutes winner’s consent to the publication of his or her name, biographical information and likeness in any media for any commercial or promotional purpose, without limitation to the Internet or further compensation. By participating, entrants agree to be bound by these Official Rules and the decisions of Naheola Credit Union. Please be aware that a few credit union members were paid with fraudulent checks drawn on Navy Federal Credit Union. The checks appear to be related to a Craig's list post that offers loan advances. A few credit union members apparently gave personal information to a Craig's list contact for loan advances and a check was sent to the member with their account numbers on the check. Please be cautious of giving out your personal and financial information !!!! If you detect suspicious activity relating to your debit card and draft account please call 1-800-472-3272 to deactivate your debit card. New debit cards can be issued instantly at all of our Branch locations. Protecting our members from potential losses as a result of financial crime is very important to Naheola Credit Union. We communicate and work with several different agencies on an ongoing basis to protect our members from financial fraud. But, despite our best efforts to prevent fraud, it does occur. Additionally, we have increased and upgraded our fraud detection network through our data processor. Please be mindful of internet transactions and giving your debit card information over the phone to vendors. Data breaches are occurring more frequently which has led to most if not all of the fraudulent transactions that have occurred not only at Naheola Credit Union but most every other financial institution as well. If you would like to assist in stopping these occurrences, please notify your congressional representatives to Stop the Data Breaches! The Credit Union industry and other Financial institutions have been communicating our efforts to them for quite a while. The merchants have very little liability for a data breach. Contritely, most of the fraud occurs from intrusions on their databases and networks. If they shared more of the liability, maybe they would spruce up their security as all of the financial institutions have already done. Please check your account daily and review your transactions. Contact Naheola Credit Union immediately if there are transactions you have not authorized. We pride ourselves on helping our members resolve these issues.